Overnight in dozens of cities across the U.S., the electric scooters arrive, often without warning to public officials, parked along sidewalks and ready to be taken for a spin with a few taps on a smartphone. In some cities, lawsuits and cease-and-desist orders have sometimes followed. MILWAUKEE (AP) — Overnight in dozens of cities across the U.S., the electric scooters arrive, often without warning to public officials, parked along sidewalks and ready to be taken for a spin with a few taps on a smartphone. It’s not long before they attract attention — and it’s not always positive: Lawsuits and cease-and-desist orders have sometimes followed the arrival of California-based companies Bird Rides Inc., LimeBike and Spin, with city officials saying the scooters aren’t legal to operate on streets or the sidewalks where they get dangerously close to pedestrians. And because the scooters are dockless, they’re parked anywhere when a ride is over, causing cities heartburn over blocked sidewalks. 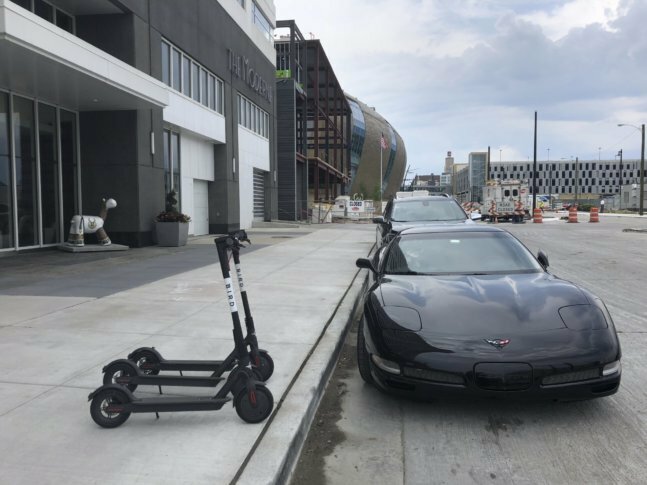 Nashville, Tennessee, sued last month before impounding all of Bird’s scooters. The city since dropped its lawsuit and is working on regulations for the scooters. In San Francisco, the city banned the scooters on June 4, requiring Bird and other companies, to apply for permits before returning. The scooters can go up to 15 mph (24 kph). Picking one up is a simple process. The Bird app shows where they’re available. Riders, who must scan in their driver’s license, unlock one by scanning a bar code for an initial charge of $1. It then costs 15 cents a minute to ride one. Once done, riders take a picture of where they left the scooter to make sure it’s properly parked. Bird picks up the scooters each night and inspects them before putting them back the next day.